Donoghue on board Tiger Roll. NOT ONLY HAS Tiger Roll won at three Cheltenham Festivals and grabbed Grand National glory but he has also revived the career of Keith Donoghue, who says he would not be where he is today but for the pint-sized superstar. Donoghue was on board Tiger Roll for his shock 25-1 success in Sunday’s Boyne Hurdle at Navan and will retain the ride when the pair try to defend their Cross Country Chase crown next month. Rewind two years and the talented rider was about to take a six-month sabbatical from the game he loves so much due to a constant, bruising battle with the scales. Meath jockey Donoghue said on Monday: “Tiger Roll has been absolutely brilliant for my career, he’s put me back on the map. There’s no way I’d be where I am now but for him. “To have an association with a horse like him is massive for me. He’s so famous now. We were clapped all the way into the winner’s enclosure at Navan yesterday. That was an incredible feeling. He continued: “About two years ago I took about five or six months out, but my weight has never been better than now. 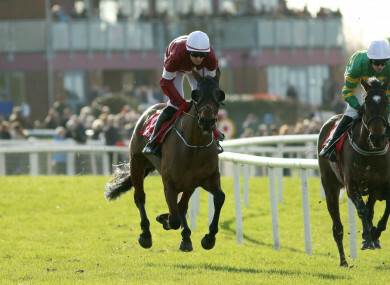 Tiger Roll is now the shortest-priced Irish-trained horse in festival ante-post markets at no bigger than 5-4 for the Cross Country, and Donoghue would not put any punters off despite such skimpy odds. “He’s actually better than ever,” added Donoghue. “He was quite stuffy in the early part of the race so there’s loads of improvement to come as well. “I kept him wide to make sure he got a proper run and a good blowout. I didn’t want to get hampered or brought down or anything like that. “Then, when we swung out of the back straight, he came back hard on the bridle and I couldn’t believe it. I was petrified I was going to get there too soon and Gordon [Elliott] would kill me, but it all worked out in the end. I cannot wait for 13 March. Beyond Cheltenham, Tiger Roll is also favourite to win the Randox Health Grand National at no bigger than 12-1, and were he to do so he would be the first to win back-to-back Nationals since the legendary Red Rum in 1973-74. Email “'He's put me back on the map' - Tiger Rolls back the years for Meath jockey Donoghue ”. Feedback on “'He's put me back on the map' - Tiger Rolls back the years for Meath jockey Donoghue ”.